Happy Monday, everyone!! Well, as I said in my post yesterday...today is my first day "on the job" with WPlus9!! 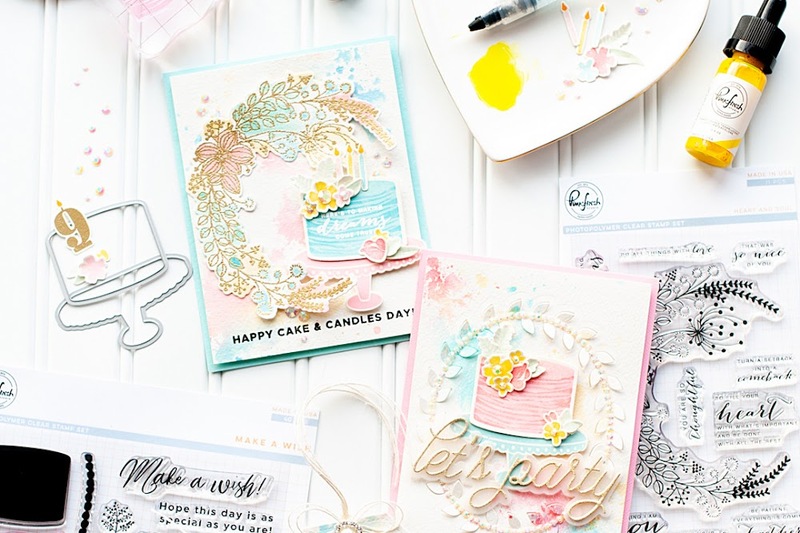 This week we are showcasing projects using the new stamp releases for April, and today the stamp set we are sharing with you is called "A Special Lady". Instructions: Fold white cardstock in half to make card base, cover with pink floral paper, and sand the edges. 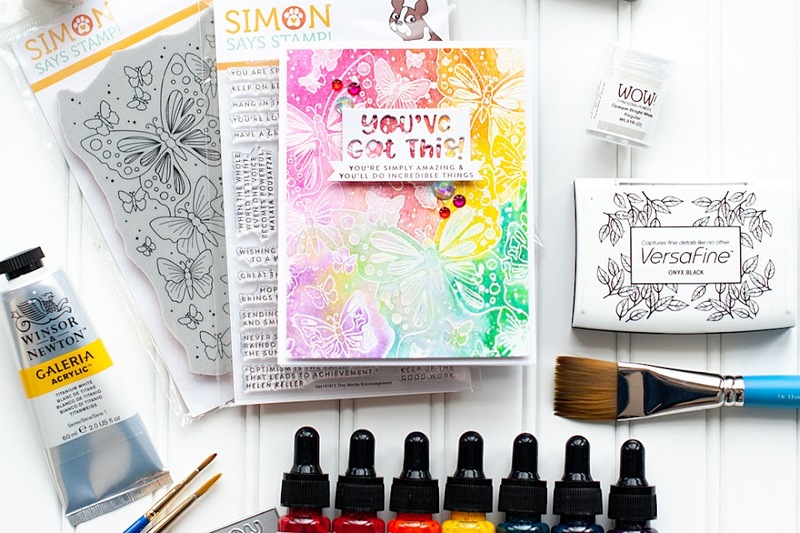 Punch an upper crest border to each side of a kraft cardstock block, ink the edges and adhere to the front. Zig zig stitch along the inside of each punched border. Stamp the flowers and sentiment to a vellum square, and then adhere to the front of the card, slightly overlapping the stitching. Add three pearls to the stamped sentiment to finish. I really love everything about this stamp set. The fonts work together perfectly, and there are so many fabulous sentiment options that you can build. And the floral images are just a perfect touch for such a feminine and elegant sentiment set. Make sure you check out what the other WPlus9 designers have created as well, as I am sure it will be a great treat! What a breath-taking card! I actually got a little teary reading the sentiment - its so touching! Stunning use of the flower image! Can't wait to see more of your Wplus9 creations! What a lovely card! The sentiment is great. I think everyone should say that against their mother. Oh, this is simply GORGEOUS! Love the way the stamps look all by themselves. It's my favorite way to go! Beautiful edging and sanding and stitching details, too! Like I said in my post, we are truly so happy to have you, girl! What a fantastically understated and bold color combo all at the same time! Love the way you combined the outer and inner sentiments using pearls for ellipses. Beautiful. Beautiful. So happy to have you on the team! Love the white flowers, and the sentiment is perfect! Simple and STUNNING Lea, I <3 it! 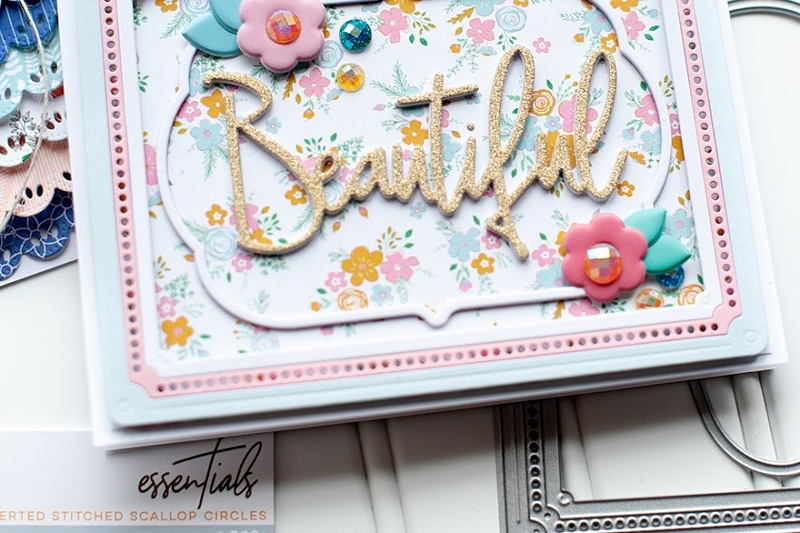 such a pretty card--love the white stamping! I love how you used the white for the images while pulling in such beautiful and bold colors in your background paper and then the pop of bright pink with "Mom" which draws your eye who the focus is to be on! Awesome job! Oh my goodness, this card is SOOOO beautiful, Lea! 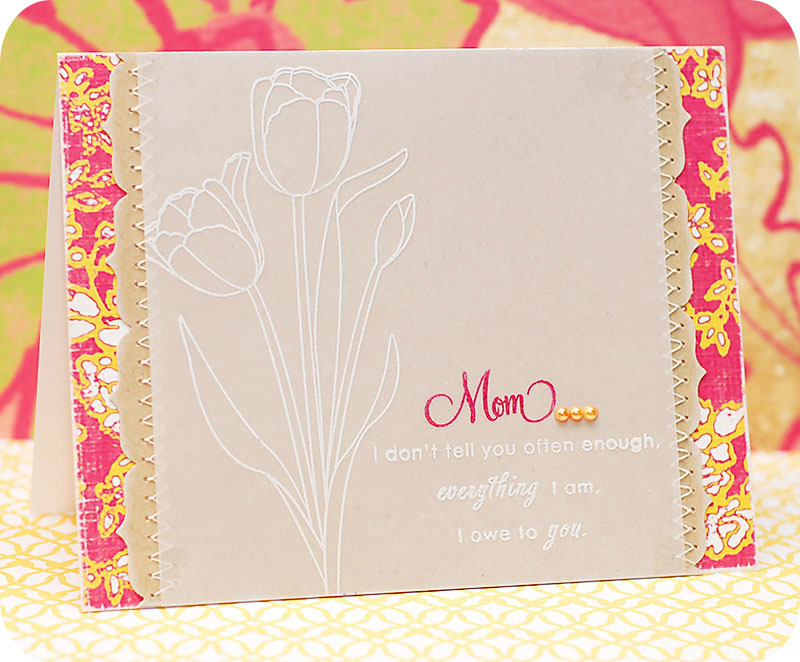 I am loving how you left the tulips uncolored and then stamped the "mom" in another color. So fab! Wow....this card is all types of gorgeousness!!!! congrats again, lea! love your card! that would be (not coloring) the flower looks beautiful and the tulips are my fave!!! Lea, Lea, Lea!!!!! Holy Moly, I am so excited that you have joined the team! I'm sure you know by now that I'm a huge fan of your talent. Your cards are full of happy and fun. Every single card you design inspires me. You are going to be a fantastic addition to the team! Dawn is a wise, wise woman to choose you! And as for this particular card? Amazing! I love the bright patterned paper popping out of the side. Brilliant layout! And, a warm, welcome. Can't wait to get to know you better, Lea!